"Great simple pasta dish. Good to have the night before a race. This is also good with sauteed shrimp." Meanwhile, heat the olive oil in a large skillet over medium heat. Stir in the bacon, and cook until the bacon has begun to shrink, about 3 minutes. Add the garlic, and continue cooking and stirring until the garlic has softened, and the bacon is crisp, about 5 minutes. 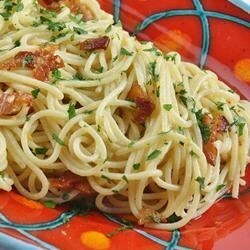 Toss the drained pasta with the bacon, oil, and parsley to serve. I make this all the time...and then sprinle with parm cheese before serving. I add a whipped up raw egg to the hot pasta along with the bacon and 1/4 c Parmesan cheese. Easy and delicious.